Particular Painting is an industrial painting contractor specializing on the application of high performance industrial coatings and surface preparation on steel and concrete. In these tough economic times, it is imperative for you company to stay competitive and keeping your infrastructure and equipment in top working condition is essential, to avoid costly downturns and shutdowns. Utilizing the latest technology in coatings and equipment and highly skilled professionals, we provide our services to a broad range of industries and we are committed to deliver your project in a timely manner, safely and in a cost effective way. With NACE Coatings Inspector on staff, we appoint the quality control measures and procedures needed to assure that every square foot of your industrial painting project receives the proper surface preparation and application of coatings for a long lasting coatings system. Safety is of great importance in industrial painting environments and for that reason we have put in place methods to prevent or control work site hazards, to ensure that all our painting services taking place in a safe environment for personnel and structures, following local and federal environmental and occupational laws and practices. 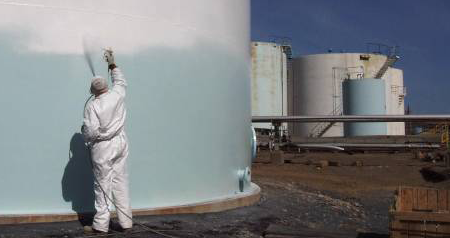 Whether you need to overcoat your existing coating system to extend its service life with zone painting or spot repair, or a complete repaint with the removal of the existing coatings and installation of a new coating system, Particular Painting will provide you with solutions which work the best for your industry for a successful coating project.